Irish traditional music, mixed with a few newer compositions in traditional forms, by others and by us. Our interpretations feature the tones and textures of our instruments in various conversations and combinations. Making the album turned out to be a wonderful journey of discovery, balancing personal blends of melodic exposition and harmonic frameworks, while hoping always to honor the tradition. Our project also includes a few songs - a traditional ballad, a new ballad based on a true and tragic story by a contemporary Canadian songwriter, and a Khalil Gibran poem that we set to music. We hope you enjoy it! THE WAKING, released in 2015, is mostly poetry-set-to-music again, with a couple of original tunes thrown in for good measure. While we did not set out to write a ‘theme’ album in the same way as we did our first album, it wound up being one, ne’ertheless. It is entitled THE WAKING, from Theodore Roethke’s poem of the same name. The poems that we selected for this album address the vicissitudes, the inscrutability, and the ultimately indomitable nature of time. And, but for Roethke, it’s a whole different crowd of poets this time: W.H. Auden, Stephen Vincent Benét, Sylvia Plath, Ted Hughes, and Jenny Joseph. The offerings range in tone from direly sombre to provocatively giddy; the offerings include a waltz, a slow air, many of our usual tough-to-categorize songs, and one that could even get filed under R&B. There is the usual panoply of voices and instruments: mandolin, mandola, Greek bouzouki, accordion, cittern, tenor guitar, and the usual array of 6, 10, and 12 string guitars in various tunings and stringing sequences. And there are some new additions as well -- whistles, flutes, violin, viola and cello -- courtesy of a few very special guests. 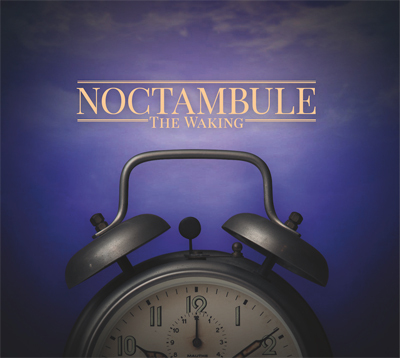 "Just occasionally in music, something comes along that just works and when it does it works to perfection, Noctambule is just that." "...poetry set magnificently to original music...exquisite excursions into daydream worlds...like taking a tour of a dozen regions of the land of the human soul...induces a trance of the most luxurious kind." 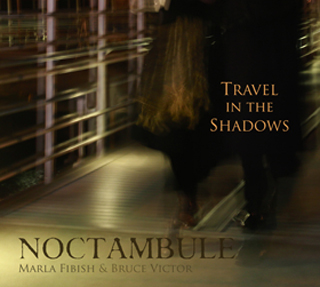 Noctambule is myself and Bruce Victor. We take our name from one of the songs on the album -- our setting of a Robert Service poem about a nocturnal ramble through the streets and less savory back alleys of Paris. The music is all original, save one traditional song. With the exception of two instrumental pieces -- a reel and a waltz -- all the songs are settings of poetry from a variety of poets-- Tennyson, Neruda, Roethke, St. Vincent Millay, and a bunch from Robert Service. The absence of the obvious sources of light will stimulate or unleash any number of emotional states: exhilaration, loneliness, love, and especially shifting degrees of trepidation, anxiety, and terror. Sadness is de rigueur for many reasons, none of which will be elaborated upon here. Perhaps the idea is to shift our perspective from looking at these states not merely as reactions to the journey, but also as one's assigned traveling companions. The songs that we have selected seem to be about solo journeys. The night journey is a mucky trek through the marshes of one's own soul, with the annoying squishy sounds of one's own faltering boots as the principal soundtrack. The sense of isolation certainly darkens the shade of the darkness. But perhaps the journey resolves once we make a peace with loneliness, and in so doing, find new sources of connectedness. It is a journey that we all make alone together. 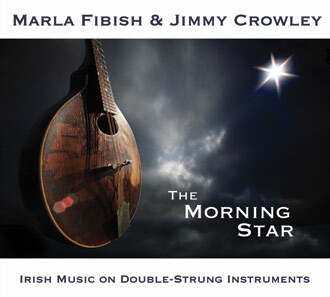 Marla teamed up with Jimmy Crowley to create a unique and delightful recording of Irish music played only on double-strung instruments. Though the world knows Jimmy as a great singer, this is an all instrumental album featuring traditional tunes of all sorts, along with an original or two from each of them, played on mandolin, mandola, mandocello, bouzouki, and a big bass bouzouki called a dordán. The project was hatched over an evening of playing tunes together at Marla’s house on one of Jimmy's trips through the Bay Area back in 2009. It was recorded in three busy days in April 2010, and released in April 2011. 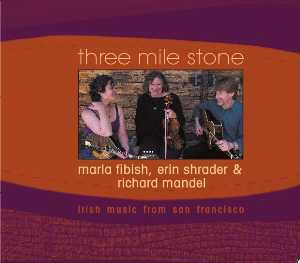 Three Mile Stone is Marla Fibish, Erin Shrader, and Richard Mandel. Three Mile Stone serves up traditional Irish music with lift, drive, and sparkle. 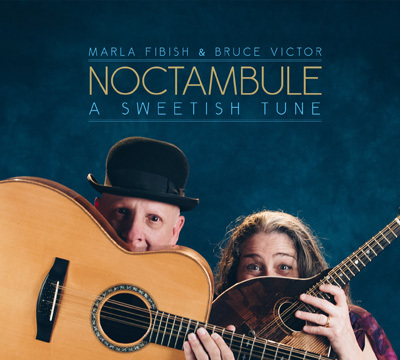 On their debut album, produced by Grammy-nominated guitar virtuoso/producer John Doyle, tight mandolin and fiddle duets with driving guitar backup give way to poignant airs, traditional songs, or poems set to breathtaking melodies by Marla. Their signature sound is all strings: fiddle, mandolin and guitar, with infectious playing, and inventive tune and song arrangements, in which any instrument might take the melody or play backup. Their repertoire includes familiar tunes and odd ones, a melding of Erin, Marla, and Richard’s repertoire across the decades and the miles. Driving reels, lively jigs, and catchy polkas from Ireland, not to mention a smattering of Quebecois and other styles, come together with a sound all their own. “The tunes are delightfully tastefully managed..., with a joyous inherent gusto....As purveyors of Irish music go, Three Mile Stone are indisputably in the top bracket, and you’re seriously unlikely to come across a much more elegantly persuasive and genuinely uplifting small-ensemble record than their eponymous debut." The DVD gives practical instruction on right and left hand technique, rhythm, phrasing and musicality, taught through nine session-friendly traditional tunes. Each tune is first played at a lively tempo, then taught phrase-by-phrase shot close-up, and finally played three times through at a moderate practice pace. "...a great addition to the mandolin instruction I’ve seen out there! Well done!" "Fibish provides excellent principled direction that emphasizes groove over flash. 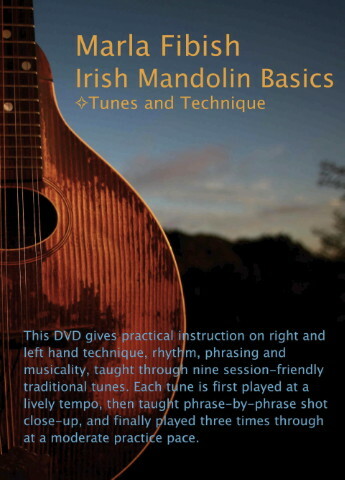 Ultimately, this is the best lesson a new player can learn...this DVD will cement her growing and already sterling reputation and will help better define the mandolin’s role in traditional Irish music..."
"This DVD is a delightful way to learn to play this style. I certainly hope it is only the first of more to come from Marla on Irish mandolin instruction!"